It is still possible to obtain a complete collection from the Faroe Islands, but you need to start now before it will be to late. Subscribe today. 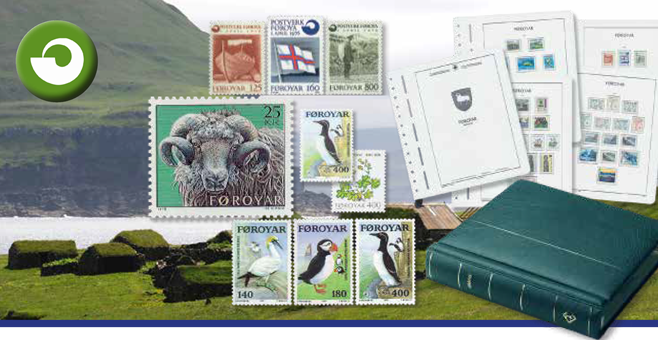 The first shipment contains all stamps from the Faroe Islands from the first was issued in 1975 and until the year 1981. Catalogue value: 496 DKK. The stamps are delivered with 6 matching pre-printed album pages with mounts. Total value of the shipment: 636 DKK – introduction price for the first shipment: Only 200 DKK. Order now and get a miniature sheet engraved by Slania for free with the first shipment plus the entire year 2004 for free in the fourth shipment. Order now and receive gifts at a value of more than 540 DKK. In the second shipment you can look forward to not only stamps and matching album pages, but also a luxury album in the well-known Leuchtturm quality in green leatherette with Faroe Islands in gold print on the spine.